Once per turn, during your next Standby Phase after this card was destroyed by a card effect and sent to the GY: Special Summon this card from the GY. If you do: Destroy all Spells and Traps on the field. This monster is the cover card for both Flaming Eternity and Dark Revelation Volume 3. This monster has several counterparts. This card resembles The Winged Dragon of Ra in appearance. Its vaguely feminine appearance would imply that this card could be the female counterpart to that card. This monster appears in the artwork of Phoenix Wing Wind Blast and one of her feathers appears in the artwork of A Feather of the Phoenix. In fact, its pose resembles the same pose The Winged Dragon of Ra is in when it appears in the Japanese opening WILD DRIVE. Nephthys was an Egyptian goddess associated with birth and death, just as this monster keeps being reborn when it is killed. In Egyptian mythology, Nephthys was in fact the mother of Anubis, therefore making her the true Queen of the Underworld. The idea of this card reviving itself from the Graveyard comes from the idea of a Phoenix being able to revive itself. This concept is also exemplified in Fire King High Avatar Garunix, a monster that also partly takes after a phoenix and whose first effect is very similar to this card's. Aptly enough, both monsters also have the same Attribute, Level and Type. This monster is based on a Phoenix but it has a birdman-like body like a Garuda. If you Special Summon "Hand of Nephthys" with "Junk Synchron", and "Hand of Nephthys" activates her effect by Tributing herself and "Junk Synchron, then her effect is still negated and you will not Special Summon "Sacred Phoenix of Nephthys". This is because the effect was activated on the field. : When Special Summoned by "Junk Synchron", is the effect of "Hand of Nephthys" negated, even when it leaves the field? You can activate "Divine Wrath" when "Sacred Phoenix of Nephthys" is Special Summoned by its own effect. Because this effect activates in the Graveyard, and is being negated while "Sacred Phoenix of Nephthys" is in the Graveyard, "Sacred Phoenix of Nephthys" is never Special Summoned (so the card is never moved from the Graveyard) and is never destroyed. Because it is not destroyed, its effect to Special Summon itself does not activate again. If "Sacred Phoenix of Nephthys" is Special Summoned with "Call of the Haunted" or "Premature Burial", and that card is destroyed and destroys "Sacred Phoenix of Nephthys" with its effect, you Special Summon "Sacred Phoenix of Nephthys" during your next Standby Phase because it was destroyed by a card effect. If "Sacred Phoenix of Nephthys" is destroyed while in your hand or Deck by a card effect, you still activate its effect during your next Standby Phase to Special Summon it from the Graveyard. (For example, if an effect like "Star Boy" is active, and "Sacred Phoenix of Nephthys" is Summoned, and "Chain Destruction" is activated to destroy other copies of "Sacred Phoenix of Nephthys" in the hand and Deck, those copies will be Special Summoned during your next Standby Phase. If "Skill Drain" is active on the field, the effect of "Sacred Phoenix of Nephthys" that Special Summons it from the Graveyard is still activated, because it is activated in the Graveyard. However, the effect that destroys Spell and Trap Cards on the field is negated because it activates on the field (so "Skill Drain" and other Spell and Trap Cards on the field are not destroyed in this case). If "Sacred Phoenix of Nephthys" is Summoned (except by its effect), and the Summon is negated by "Horn of Heaven", it is Special Summoned during your next Standby Phase because it was destroyed by a card effect. When it is Special Summoned by its own effect, "Horn of Heaven" or "Solemn Judgment" cannot be activated, because it is being Summoned by its own Trigger Effect, not by a built-in "this is how you Summon this monster" effect. If your opponent controls your "Sacred Phoenix of Nephthys", and it is destroyed by a card effect, because the effect activates in the Graveyard, it is the owner that gets the effect and Special Summons "Sacred Phoenix of Nephthys" during their Standby Phase. If "Sacred Phoenix of Nephthys" is destroyed during your Draw Phase, you can Special Summon it during the Standby Phase of that same turn. If "Sacred Phoenix of Nephthys" is destroyed and removed from play, such as with "Bottomless Trap Hole", it is not Special Summoned from out of play during the Standby Phase, because this effect activates in the Graveyard. You can chain to the effect of "Sacred Phoenix of Nephthys" that destroys all Spell and Trap Cards. If "Rivalry of Warlords" is active, and your opponent takes control of your "Sacred Phoenix of Nephthys" while controlling monsters that are not Winged Beast-Type, "Sacred Phoenix of Nephthys" is not considered destroyed by the effect of "Rivalry of Warlords", but rather by a condition that made it impossible for it to exist on that side of the field. So it is not Special Summoned by its own effect during the Standby Phase. If "Sacred Phoenix of Nephthys" is Special Summoned by its effect during the Standby Phase, and "Card of Safe Return" is on the field, "Sacred Phoenix of Nephthys" is Step 1 of the chain and "Card of Safe Return" is Step 2, so "Card of Safe Return" resolves first and you draw a card before "Card of Safe Return" is destroyed. Divine Wrath: You can activate "Divine Wrath" when "Vampire Lord" or "Sacred Phoenix of Nephthys" activate their effects in the Graveyard, and their effects are negated and they are not Special Summoned; but because they cannot be "destroyed" while in the Graveyard, they are not destroyed by a card effect so their effect will not activate again. Dragonic Knight: "Dragonic Knight's" effect can only be activated if the effect of your opponent Monster Card targets card(s) you control. When your opponent activates the effect of "Sacred Phoenix of Nephthys" to destroy every Spell and Trap Card on the field, you cannot chain "Dragonic Knight's" effect, because the effect of "Sacred Phoenix of Nephthys" does not target your Spell or Trap Cards on the field. Hand of Nephthys: You can chain to the activation of "Hand of Nephthys" effect with the effect of "Royal Oppression" to negate the Special Summon of "Sacred Phoenix of Nephthys". 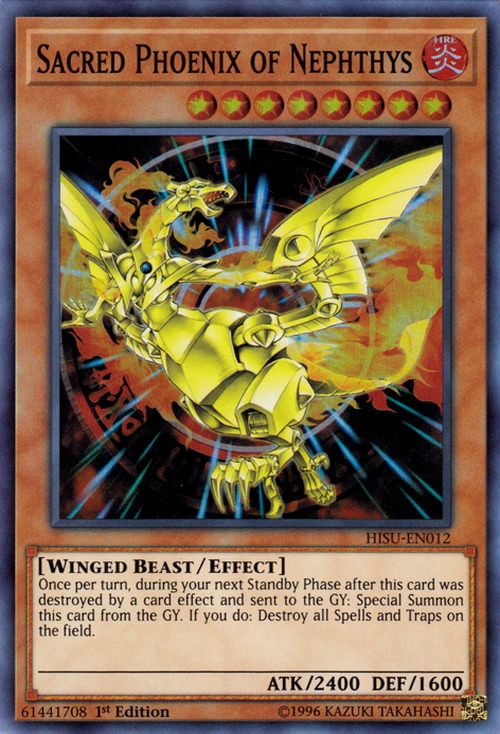 If "Sacred Phoenix of Nephthys" is destroyed while it is not a Monster Card, such as when it is equipped to "Relinquished" or "Sword Hunter", its effect does not activate and it is not Special Summoned.The newest errata of "Sacred Phoenix of Nephthys" has Problem-Solving Card Text which shows its effect to Special Summon itself will activate regardless of if it was destroyed as a monster.